Grab your girlfriends and experience Cairns like never before. The Ultimate Cairns Girls Getaway will give you everlasting memories! This package takes you to the Great Barrier Reef in luxury and style – just like a VIP!. Then it’s off to Kuranda rainforest, horseback riding and then finishing with a sunset dinner cruise. The Reef Cruise with “Celebrity Feel!”. Our Great Barrier Reef “Top Deck Club” VIP Day is perfect for your Ultimate Cairns Girls Getaway. Enjoy a VIP reef trip with your own personal crew member looking after your group both in and out of the water! Begin your journey in the exclusive Captain’s wheelhouse Top Deck Lounge. Cruise out to your first of two pristine outer Great Barrier Reef locations. Discover the natural wonders of the Great Barrier Reef. 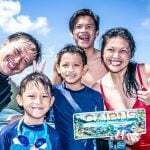 Have your own crew member take you on a snorkel tour and guided introductory / certified scuba dive*. Your own Personal Valet assigned to you for the day. Access to the exclusive Captain’s Wheelhouse. Top Deck Lounge breakfast served to your table. A glass of champagne, cheese and fruit plate on the return journey. Unlimited snorkeling at 2 sensational locations. Up to 6 hours on the Great Barrier Reef. Glass Bottom boat tour (combined with other passengers). Marine Biologist presentation (combined with other passengers). All snorkeling and scuba diving equipment including wetsuits. Return inner city bus transfers to marina. All Government Reef Levies and Taxes. Cash or Credit Card for additional small purchases. Proof of certification if you’re a Certified Diver. 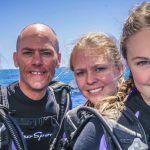 Queensland, Australia has some of the strictest scuba diving rules in the world but also the safest scuba diving record. We are regulated by the Queensland Government Code of Practice. We must comply with all rules including medical as is the law. To avoid disappointment on your day of travel we strongly recommend that all of our passengers complete our dive medical questionnaire prior to booking. Some medical conditions, age and / or medications may prevent you from scuba diving. Experience the breathtaking tropical Rainforest. From ground level on the scenic train, learn about the history of the tropical north. Gaze out of the window at the stunning scenery. The Ultimate Cairns Girls Getaway is not complete without a visit to Rainforeststation. Set on 100 acres of World Heritage Rainforest. You will experience the tropical rainforest from a totally unique perspective. A traditional Aussie Outback venue is where you enjoy your delicious BBQ Buffet Lunch. Skyrail Rainforest Cableway provides an extraordinary birds-eye-view of the rainforest. Soar meters above the rainforest canopy. Descend through the canopy layers, deep into the heart of the jungle. Hop off at Skyrail’s two mid-stations stops to enjoy a walk through the rainforest. Pamagirri Aboriginal Experience Army Duck Rainforest Tour. BBQ Buffet Lunch. Enjoy a delicious hot buffet and a wide selection of salads, cheeses and fruits. You’ll have the opportunity to have your photo taken cuddling a holding a small crocodile (Optional extra). 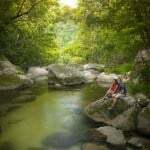 Return Transfers to and from Cairns City Accommodation. Experience the oldest living Rainforest in the world while on horse-back! The friendly nature horses will take you through the stunning crystal clear waters of the surrounding wetlands and river systems. This tour is suitable for all ages and levels. It’s the perfect adventure for the Ultimate Cairns Girls Getaway. Your own personal tour guide will take you out to explore the beautiful 150 acres at the most appropriate pace. They will tailor the tour to perfectly suit your ability. The company is renowned for the excellent care and treatment of their animals. Bus transfers from Cairns City accommodation. All safety equipment and briefing. 1.5 hours of horse riding. Assorted scenic trails – rainforest, river and mountain ranges. Light meal (small variety of cakes, cookies, tropical fruit, tea and coffee). Cash for professional photos / souvenirs. Hire available for long pants, raincoats and boots. Your Ultimate Cairns Girls Getaway is drawing to an end. What better way to finish it off with a relaxing dinner cruise! The night begins with wine, as all good dinner cruises should. With your glasses charged, stroll the interior or exterior decks and admire the view. Your journey takes you deep into the heart of Trinity Inlet. Crossing the waterfront precinct of Cairns from the Cruise Liner Terminal to the Esplanade. Enjoy live entertainment and a delicious buffet featuring some of the region’s best produce. The ultimate in waterside dining. The best way to top off your Ultimate Cairns Girls Getaway! 2.5 hour calm water sunset/evening cruise. Complimentary glass of sparkling wine, beer or soft drink on arrival. Delicious hot and cold dinner buffet, featuring fresh seafood. Live entertainment by Cairns’ best local musicians. Beverages from licensed bar available at extra cost. Jacket for the winter months. Cash or credit card for bar purchases.